Plants tufted, without creeping rhizomes. Culms 2-12(-19) cm × 0.2-0.4 mm. Leaves: distal leaf sheaths firm, distally tightly sheathing, apex acute. Spikelets ovoid to ellipsoid, 2-6(-8) × 1-2.5 mm, apex acute; proximal scale with or without flower, not amplexicaulous; floral scales to 100, 15-19 per mm of rachilla, often loosely appressed, dark red-brown to stramineous, ovate to elliptic, 0.6-1.3 × 0.3-0.7 mm, membranous, apex rounded to acute. Flowers: perianth bristles (0-)4-6, typically 4, colorless to whitish, vestigial to 1/2 as long as achene, smooth or spinuliferous; styles 2-fid. Achenes black, obovoid, biconvex, 0.3-0.5 × 0.3-0.4 mm, apex often constricted proximal to tubercle, smooth at 40X. Tubercles stramineous to whitish, umbonate to subconic, 0.1-0.2 × 0.1-0.2 mm, apex acute. 2n = 20. Fruiting summer-fall (Jun-Sep). Canal banks, hammocks, irrigation ditches, lake and pond margins, maritime shores, rice fields; 0-1800 m; B.C. ; Ala., Calif., Fla., Ga., Iowa, Kans., La., Mich., Mo., Nebr., N.Mex., N.C., Okla., S.C., Tex., Wash.; Mexico; West Indies; Central America; South America; Europe (naturalized); Asia; Africa; Pacific Islands. 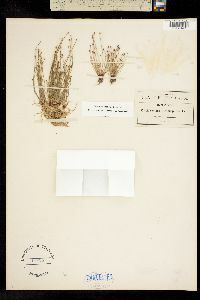 Eleocharis atropurpurea has been reported from Colorado, Montana, and Virginia; I have not seen voucher specimens. Tufted annual; stems divaricate or ascending, 3-15 cm; sheaths firm and very oblique at the top; spikelet ovoid, 2-8 mm, many-fld; scales closely imbricate, 1-1.5 mm, ovate, obtuse, with broad green or stramineous midstrip and deep brown or purplish sides; bristles whitish, scarcely barbellate, shorter than the achene, or obsolete; anthers less than 0.5 mm; style bifid; achene lenticular, obovoid, smooth and shining, black to dark cherry-red, 0.5 mm; tubercle pale, minute; 2n=20. Pantropical, n. to Ga., Io., and B.C.